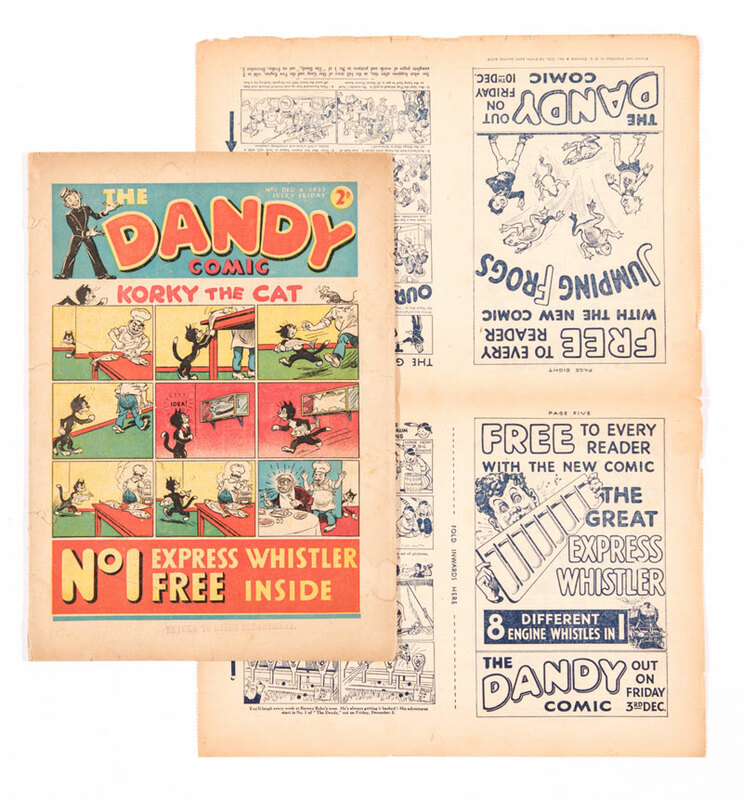 Originally a file copy at publisher’s DC Thomson, this first Dandy issue had printed on its lower margin ‘Return To Sales Dept’ and it was accompanied by an original flyer, a mini comic in its own right. A mid estimate £4200 was successfully tendered. 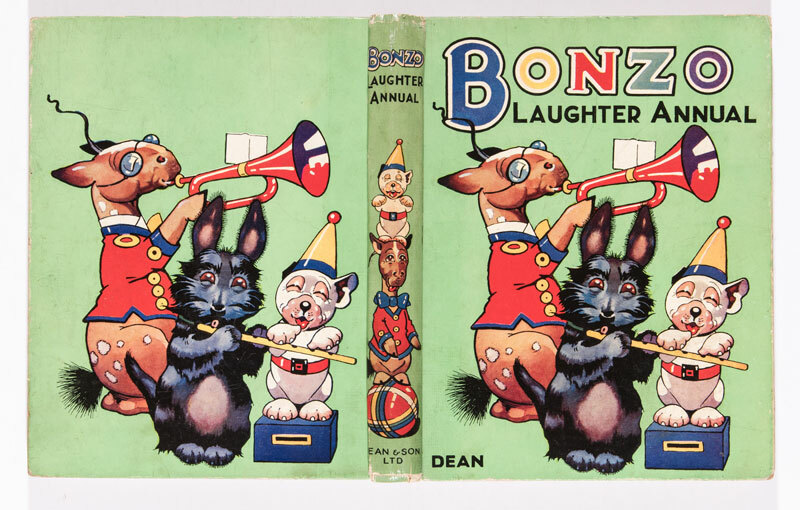 The first Bonzo Laughter annual from 1935 had the £70 winning bidder smiling. 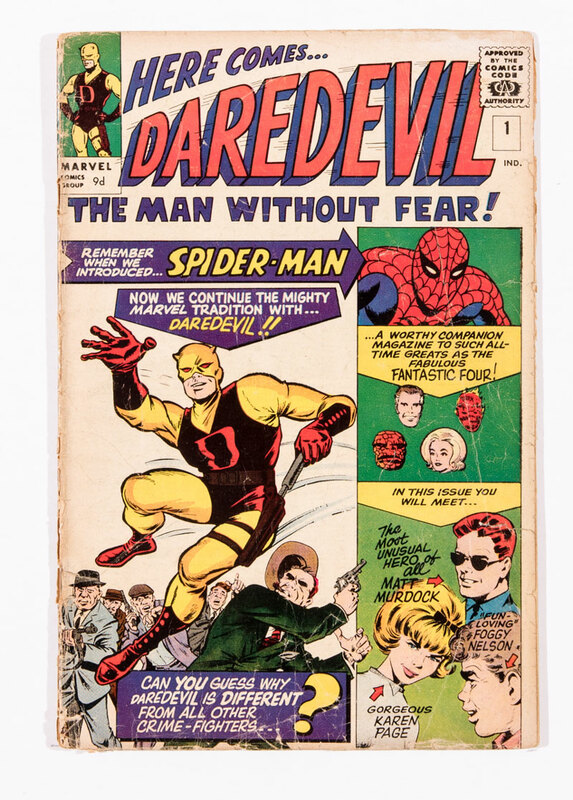 A good price for this relatively rare item. 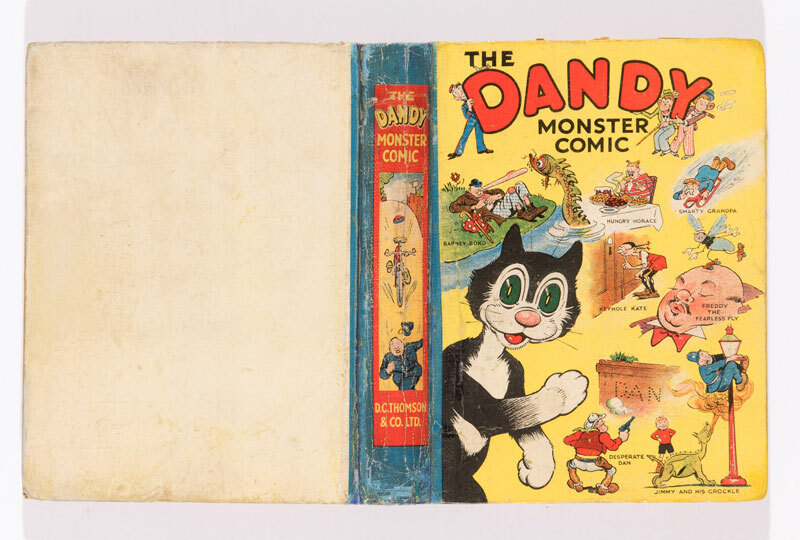 This copy of the first Dandy Monster Comic from 1939 had a professionally restored spine which did not stop it from more than doubling its upper estimate at £1140. 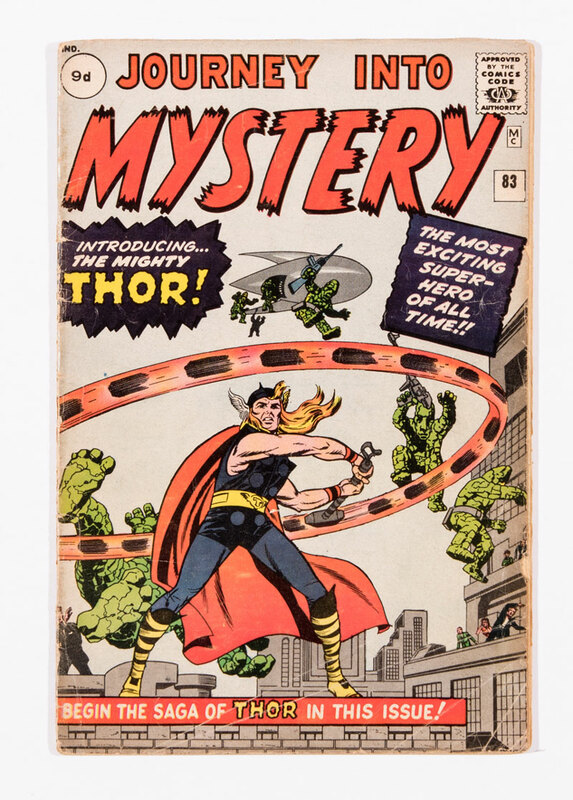 The second Monster Comic also performed strongly at £920. 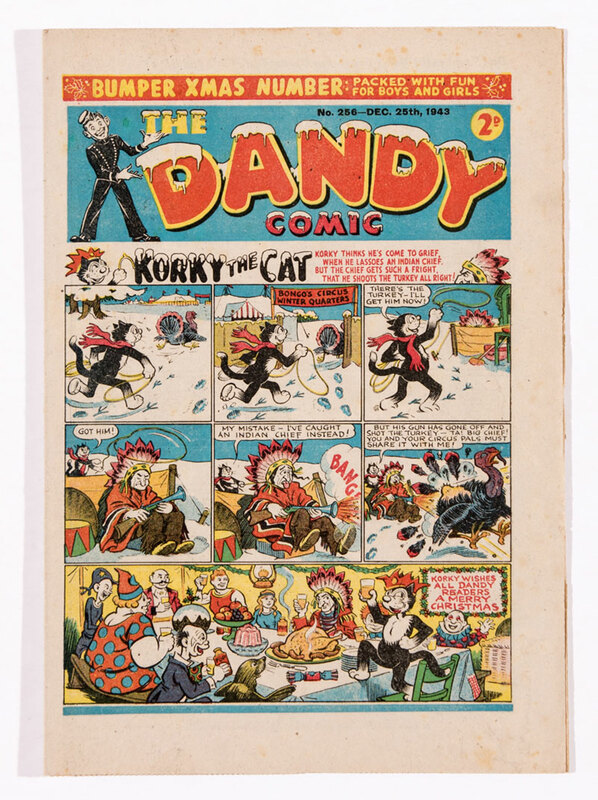 The Dandy Christmas issue for 1943 in [fn] grade garnered £210, helped, no doubt, by Desperate Dan’s wartime plea, ‘When with hats and crackers done, they can help to make a gun. So come along now, do not lag, drop them in the salvage bag!’ Along with the mangled language. 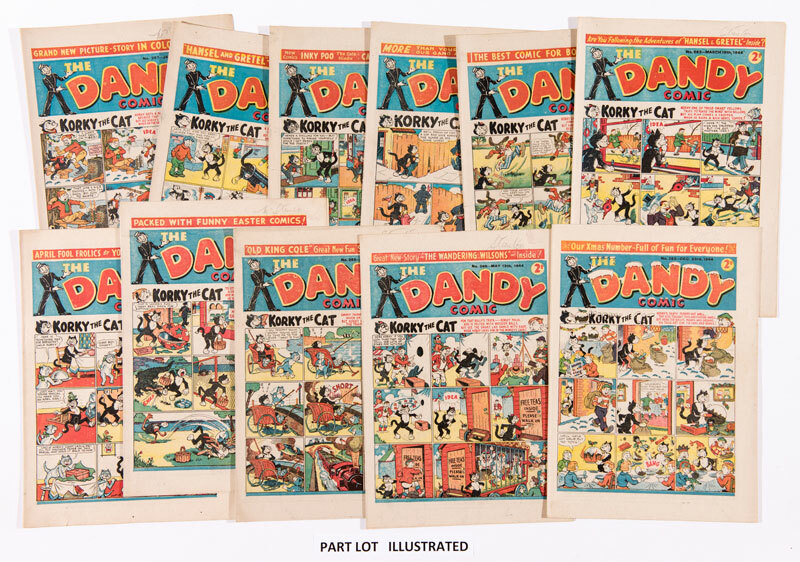 In 1944 Dandy was printed fortnightly to save paper. 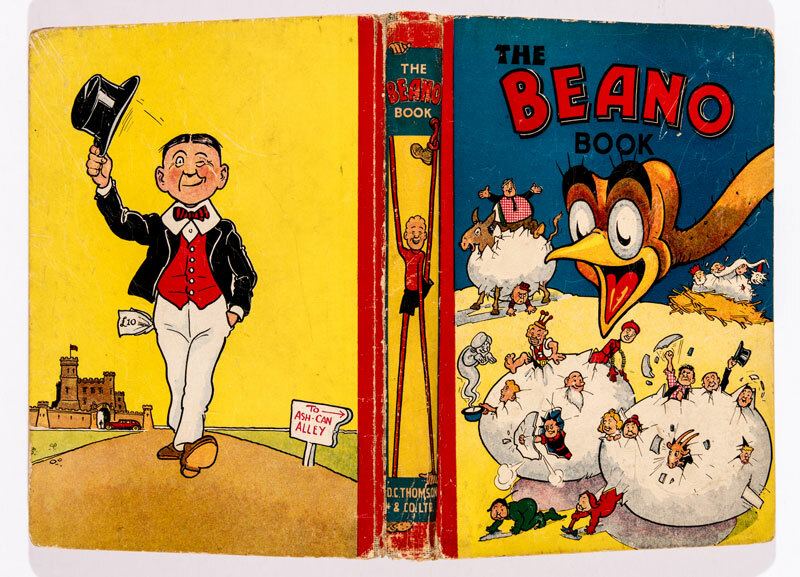 Paper stocks often varied but this complete year of 26 issues was in exceptional condition with bright fresh covers and creamy-white pages. The winning bid of £1520 reflected this. 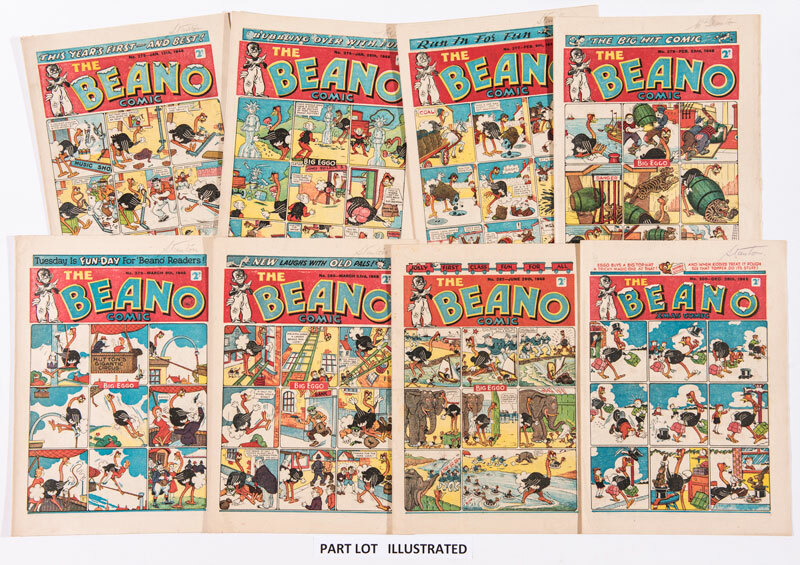 At the right price they say there is a market for everything and our Beano Comic No 1 had 8 missing centre pages, all replaced with laser colour copies. With no bids during the auction a canny buyer offered the reserve £420 after hours. He told us that at least he had a No 1 now and hoped to afford a complete copy in the years to come. 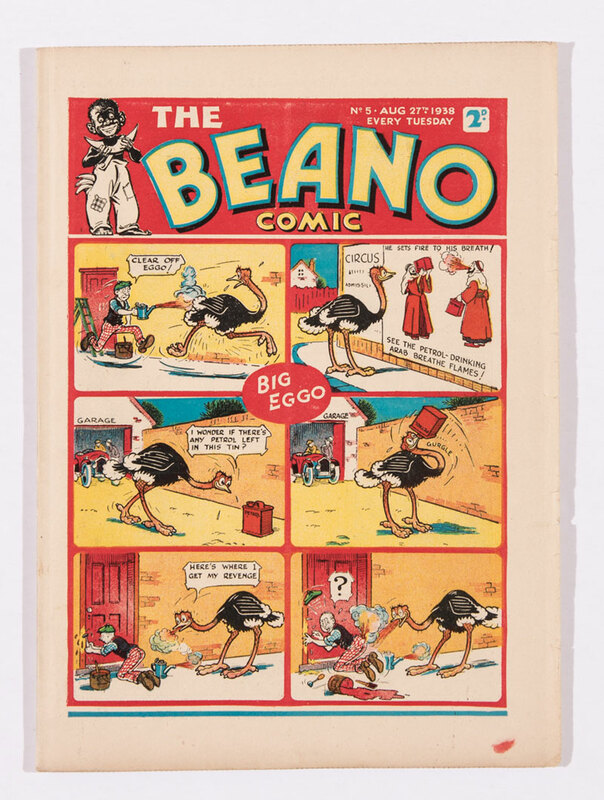 There were no such issue with our Beano comic No 5 which was one of the highest graded copies to ever appear at auction. 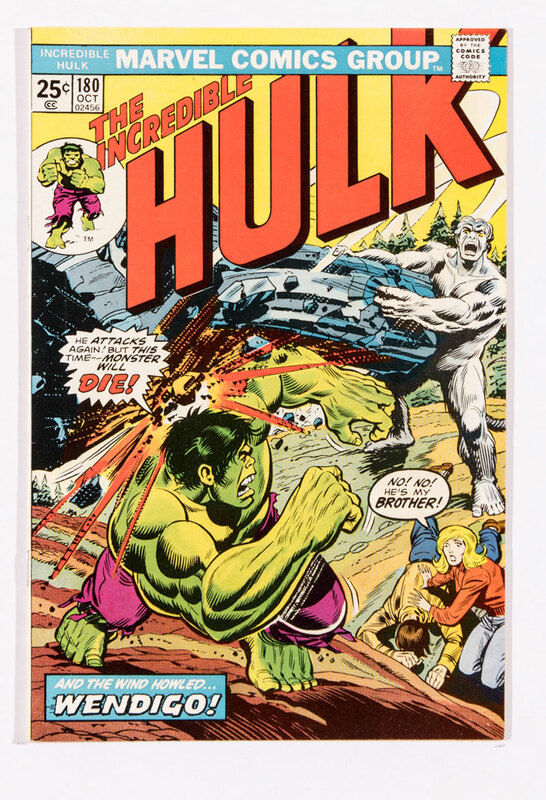 Fiercely contested, it ended up at £1920. 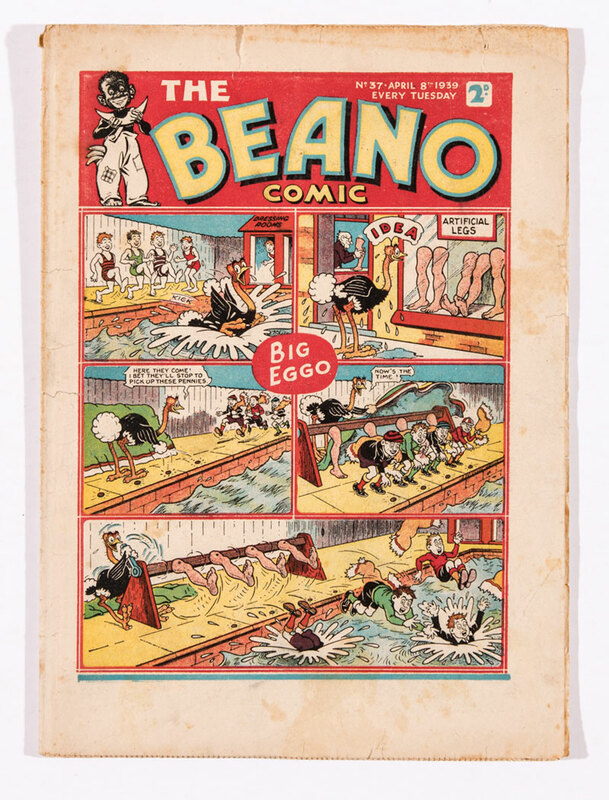 Our high grade early Beano run continued between issue numbers 52-73 generally selling in the range of £200-500 each. Here are two examples to illustrate the superb quality of the run. 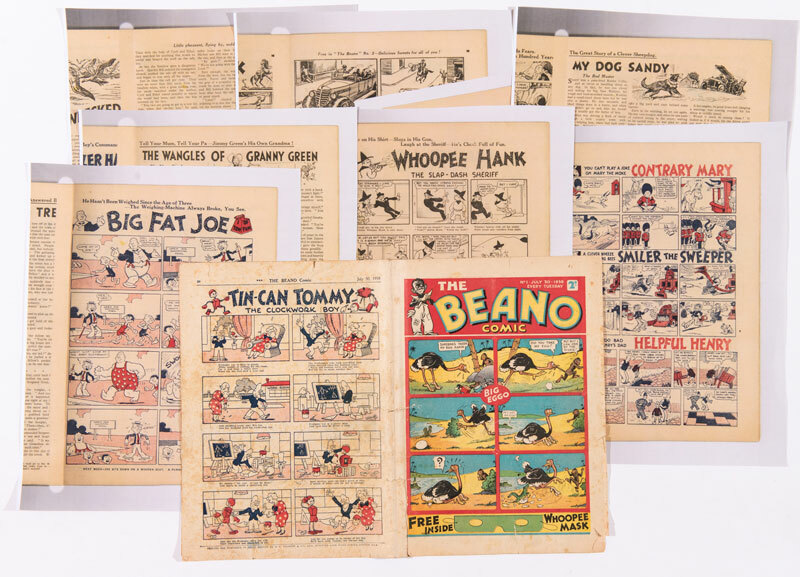 The last two issues in the high grade run were both Xmas comics, (canny DC Thomson, as ever), and their [vfn] status was rewarded with winning bids of £920 and £860 respectively. Happy Christmas. 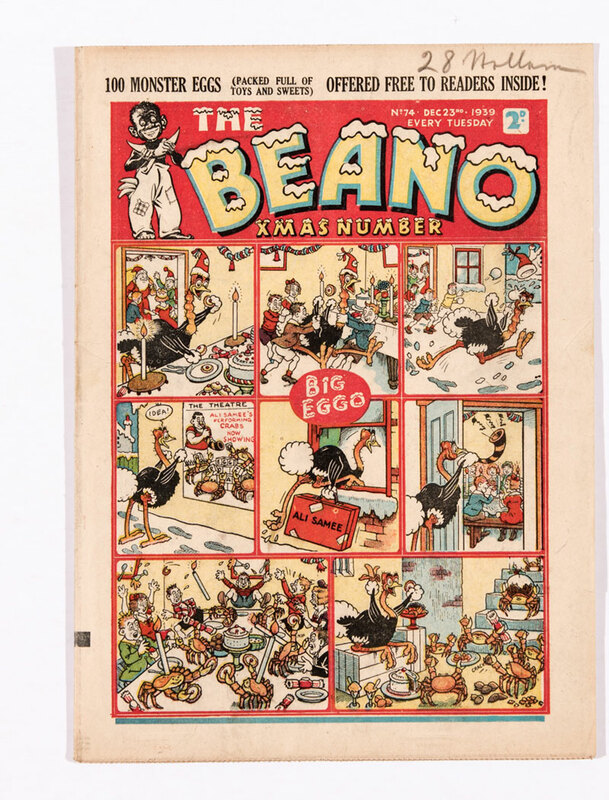 A very nice copy of the 2nd Beano Book showed Big Eggo hatching the Beano characters and a golden egg worth £2550.00. 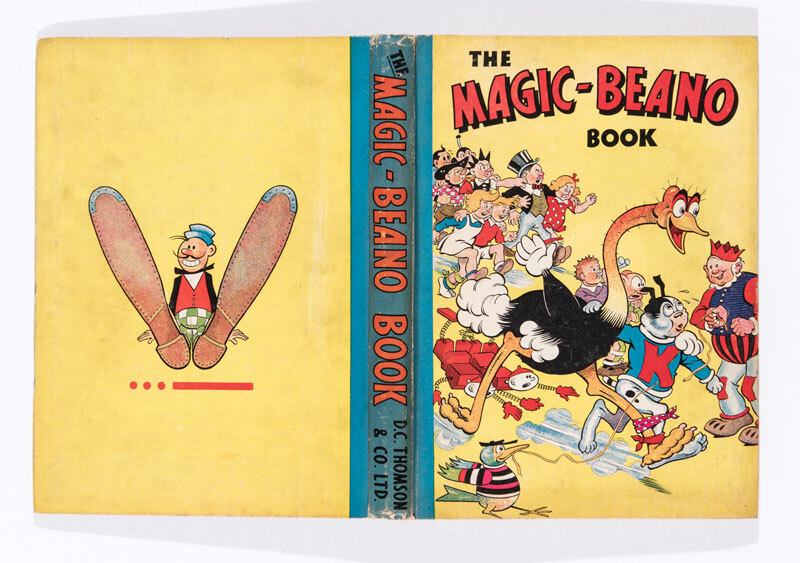 Here is one of the highest grade 1943 Magic-Beano Books ever offered at auction with propaganda back cover Tootsy McTurk’s V for Victory sign in Morse code. What’s the Morse code for £2550.00? 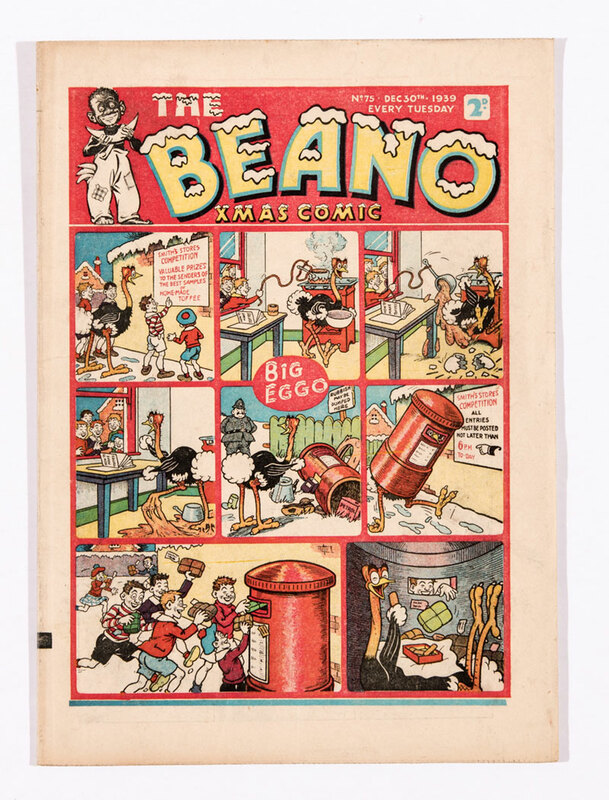 £1520.00 was paid for the complete Beano year of 1946. 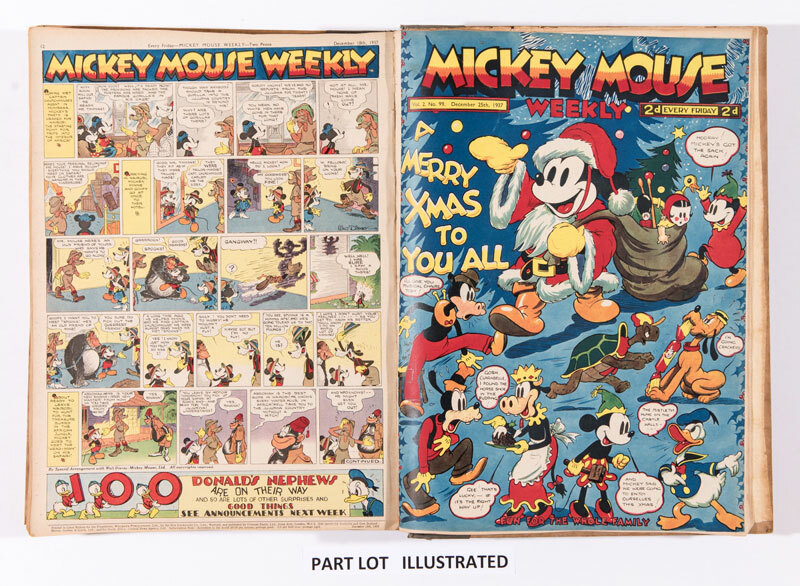 This 26 issues run had bright fresh covers and creamy white pages – exceptional condition for 1940s paper stock carefully stored down the years. 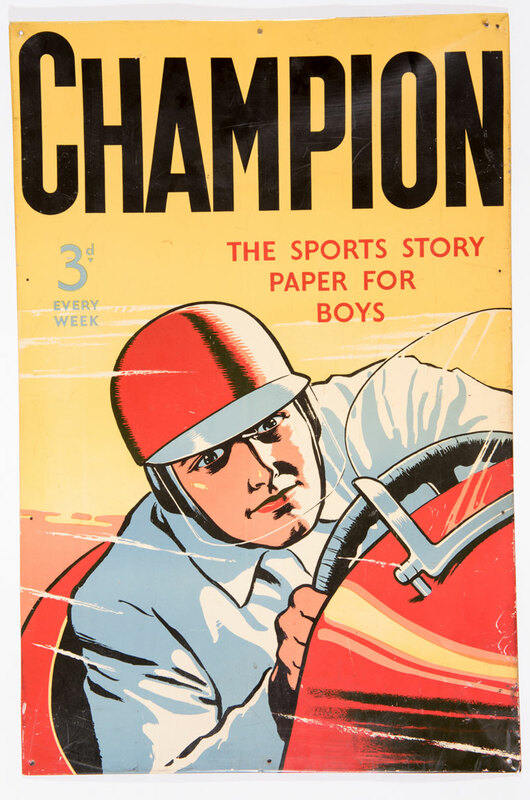 One of our regular discerning customers from Newcastle-upon-Tyne snapped up this wonderfully charismatic 1950s newsagents tin sign for Champion comics. £135 put him in pole position. 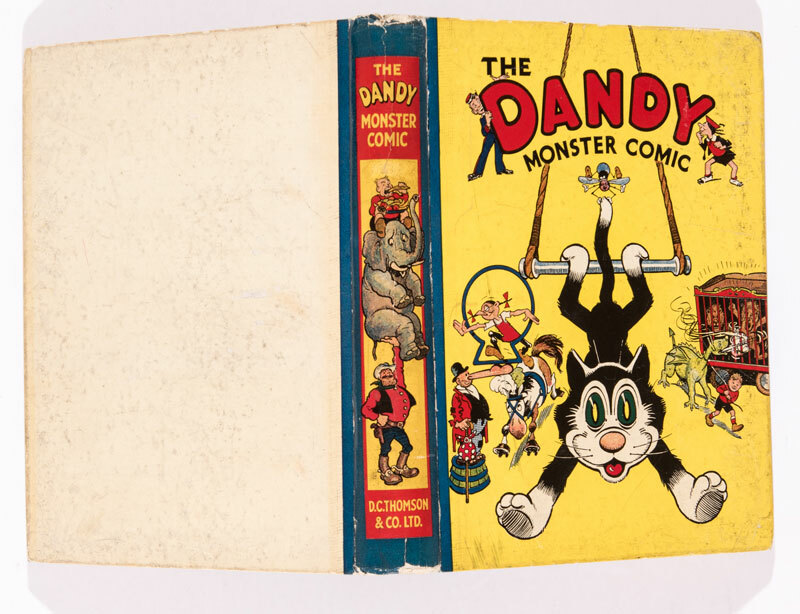 Noah Lott may know a lot of rot but The Dandy bound volume of 53 consecutive issues covering June 1950-June 1951 soared away to £560. 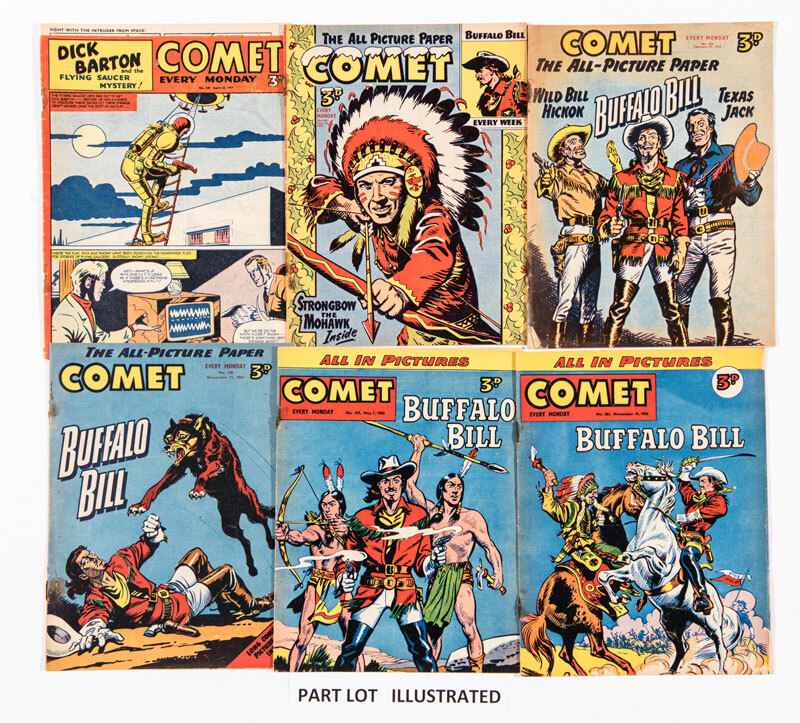 Comets are accepted with their rusty staples par for the course and 97 issues between 1952-55 made around £2.50 each. Staples rusting in the Sun returned the same price. 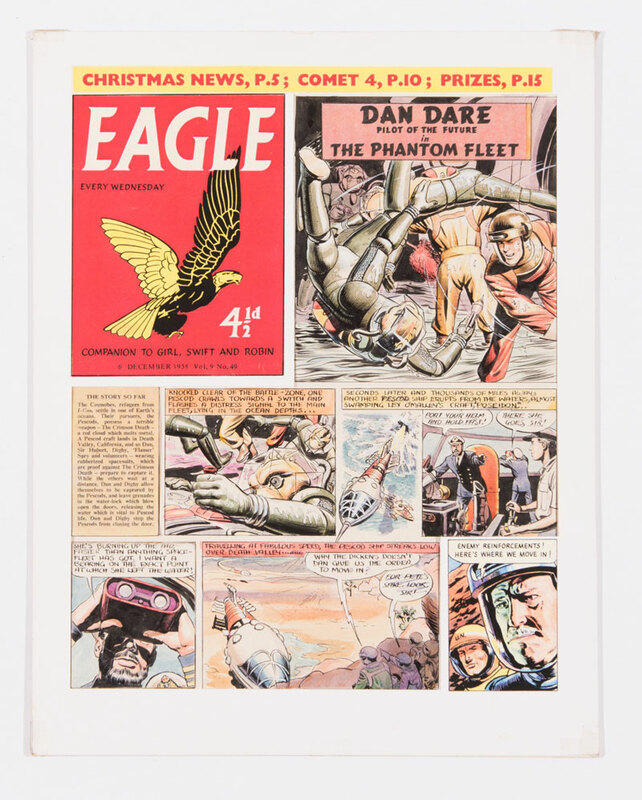 The Hampson studio often required pre-artwork visuals to storyboard their Dan Dare episodes and these were mostly destroyed once the finished artwork had text been completed. This surviving piece by Don Harley is a rare example of the genre and sold just below its estimate at £540. 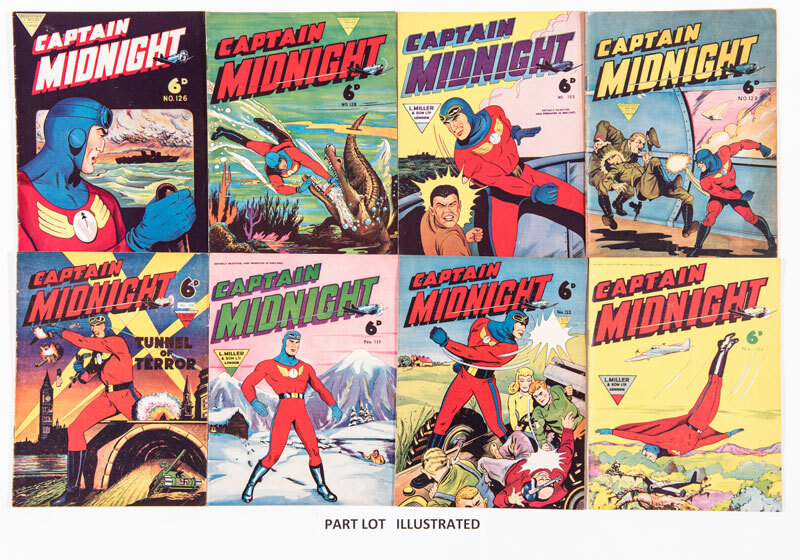 A good run of 18 L.Miller Captain Midnights made £80. 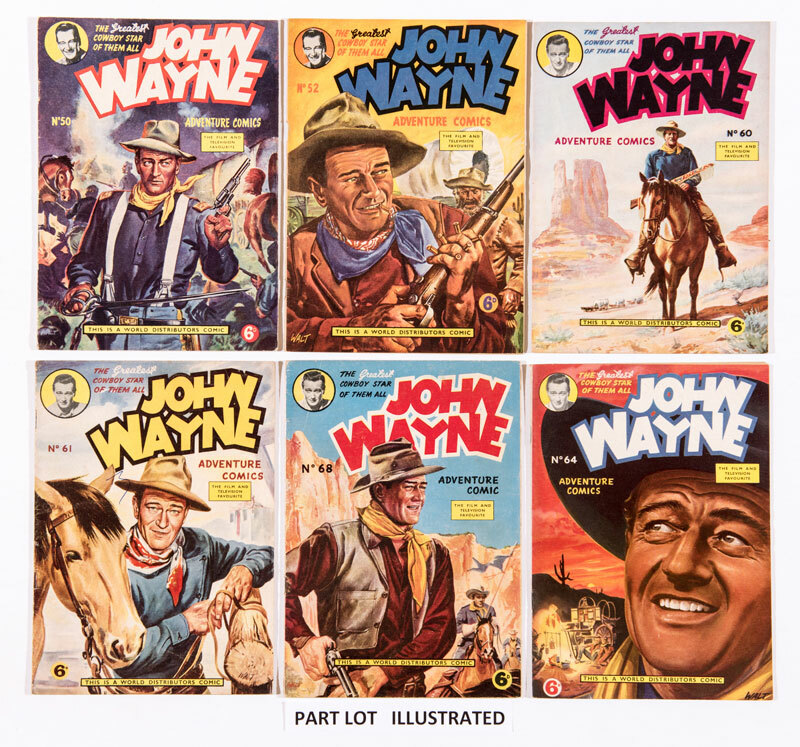 Issues 50-69 of John Wayne sure showed ‘em at £150. 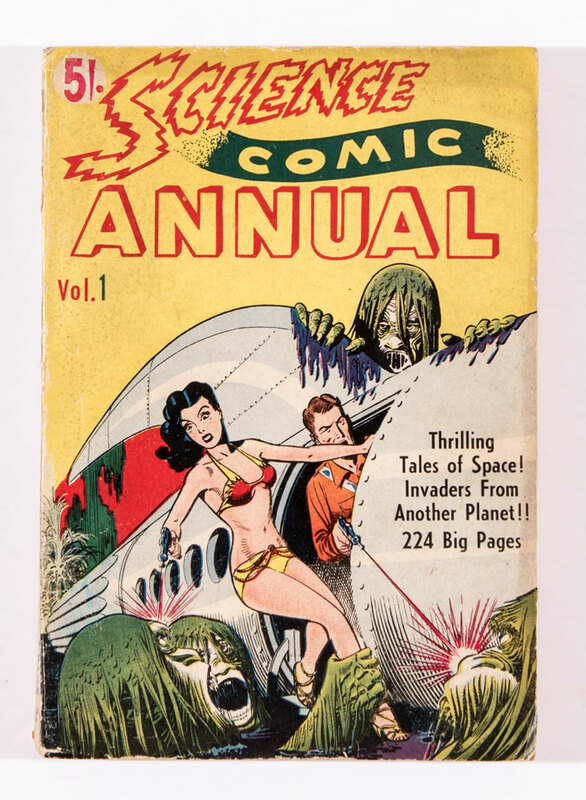 Not listed in any reference books, Australian publication, Science Comic Annual No 1 enclosed colour reprints of early Avon and DC space adventures including Eerie, Rocket To The Moon and Strange Worlds. £100 took away this rarity. 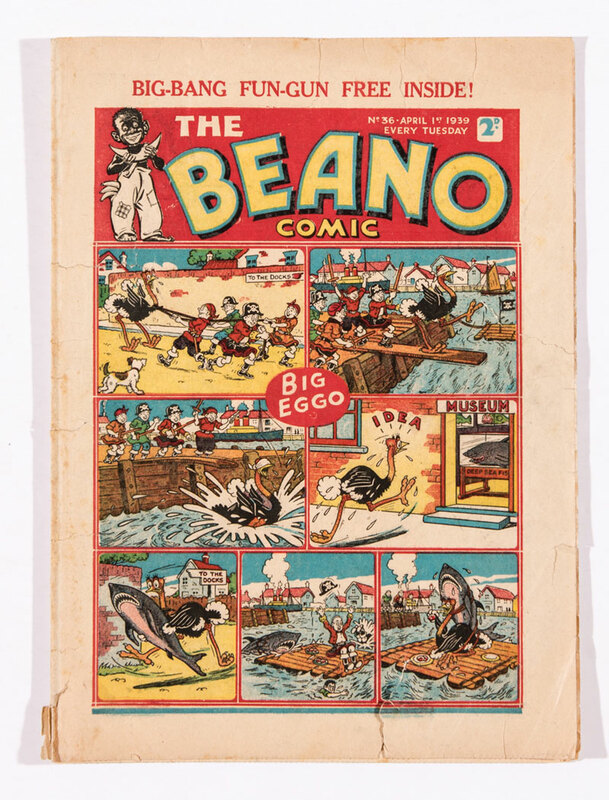 One of Dudley Watkins last artworks in 1969, this Beano / Biffo The Bear front cover realised £2250. 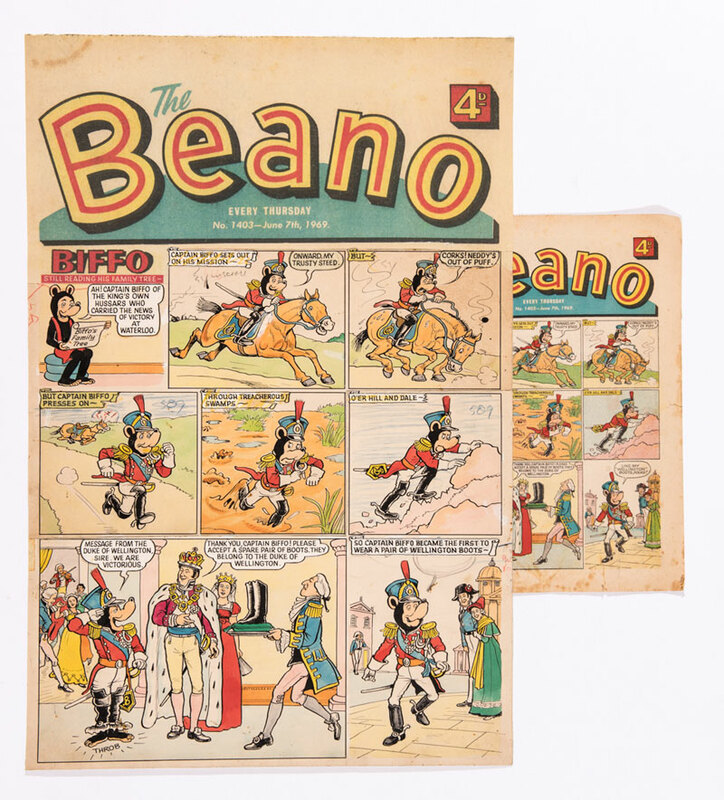 The new owner told us this filled an important hole in his artwork collection but he’s still looking for the ever elusive Broons and Oor Wullie covers and frontispieces. Help ma Boab! 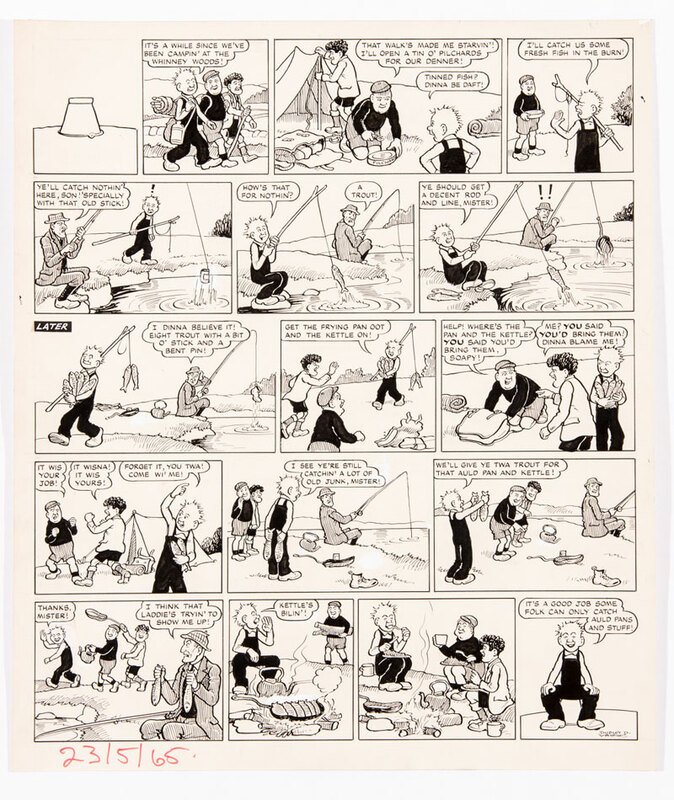 Keeping with the artwork theme Oor Wullie’s 1965 piece had the wee lad campin’ and fetchin’ a fresh trout dinner from the burn. The winning bidder fished out £540. 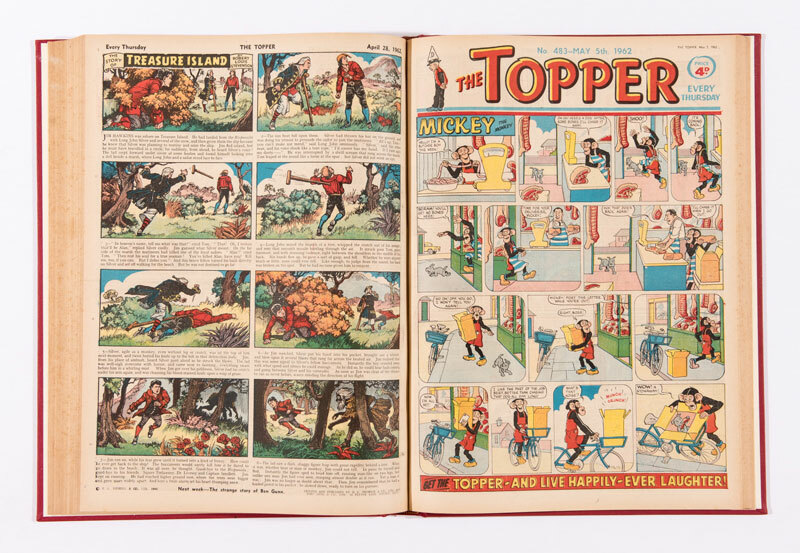 A Topper bound volume for Jan-June of 1962 had a stunning response with £540 for its 26 high grade issues. 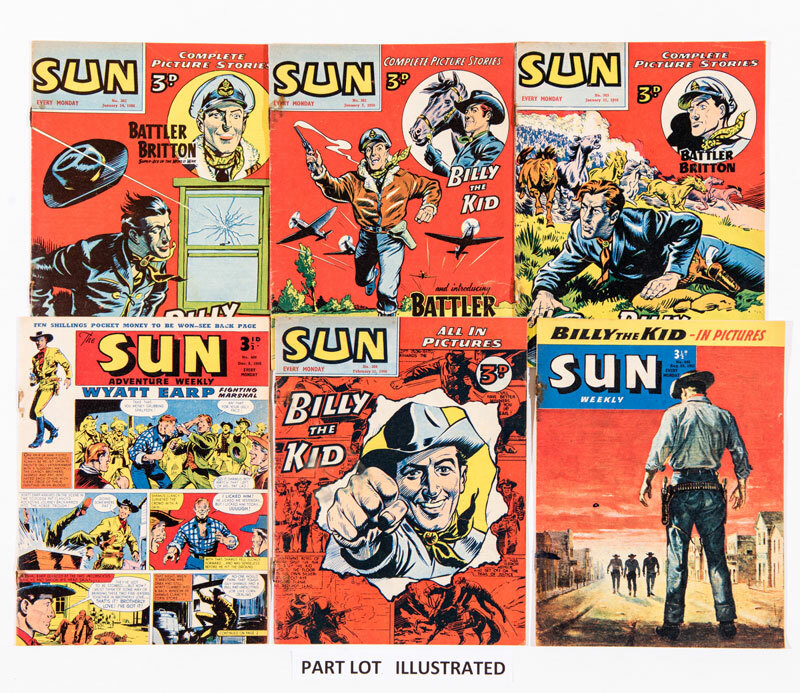 The following similar lot for 1963 (not illustrated) made £310. 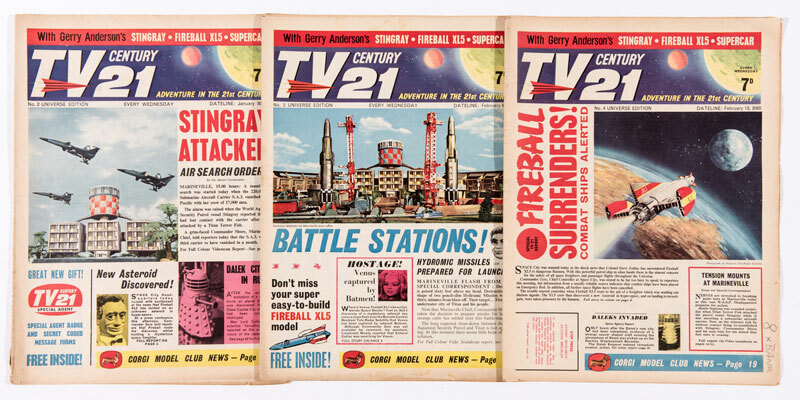 Here are TV 21 [vg] issues 2, 3 and 4 that made £135. 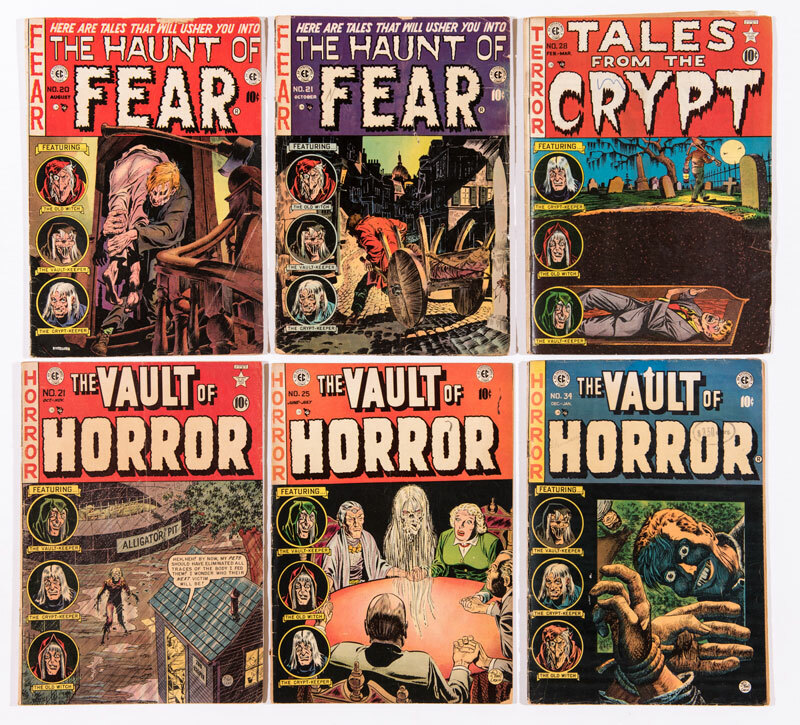 This selection of lower grade EC horror comics frightened £150 from the new owner. 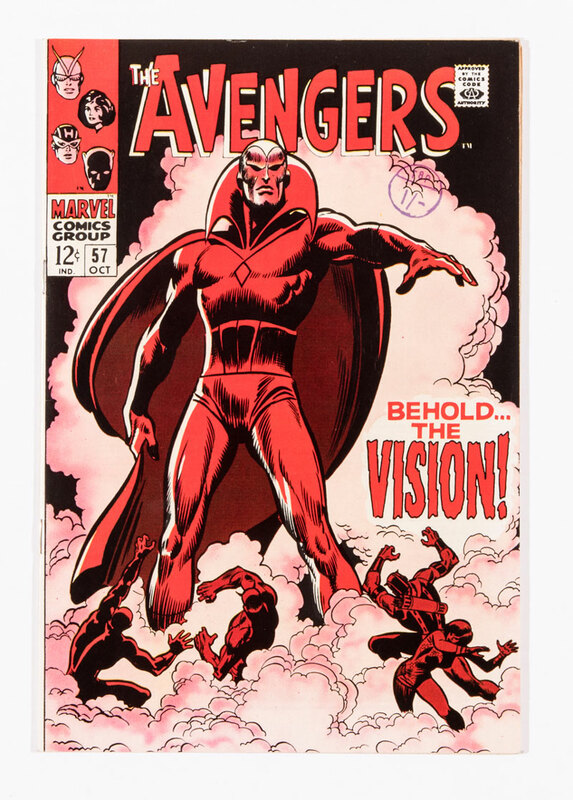 A fresh Avengers #57 at £175 and a [fr-gd] Daredevil #1 at £165 are pictured here. 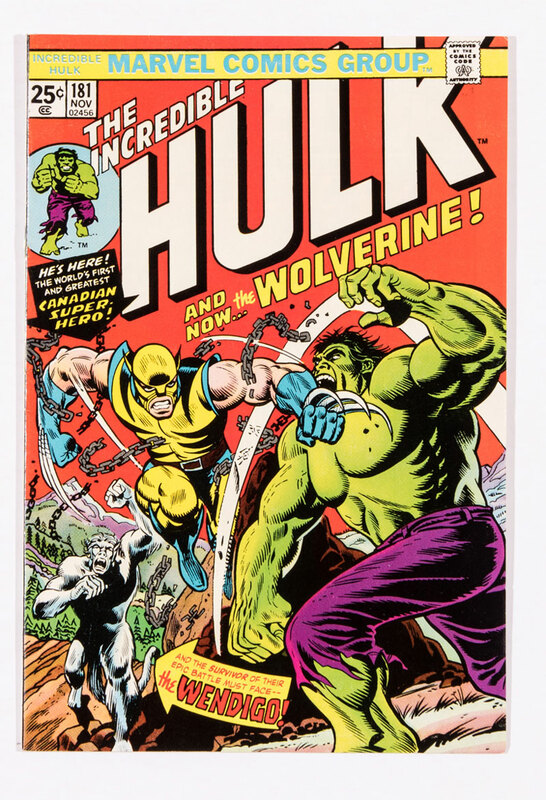 Fresh cents copies of Hulk #180 and #181 made strong impressions with £105 and £940. I’d like to take the opportunity of wishing all our buyers and sellers happy and peaceful holidays. See you in the New Year and thanks, as always, for your patronage.